Using the National Science Foundation's Robert C. Byrd Green Bank Telescope (GBT), astronomer D.J. Pisano from West Virginia University has discovered what could be a never-before-seen river of hydrogen flowing through space. This very faint, very tenuous filament of gas is streaming into the nearby galaxy NGC 6946 and may help explain how certain spiral galaxies keep up their steady pace of star formation. 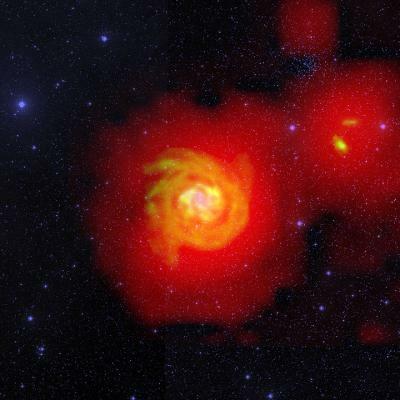 "We knew that the fuel for star formation had to come from somewhere. So far, however, we've detected only about 10 percent of what would be necessary to explain what we observe in many galaxies," said Pisano. "A leading theory is that rivers of hydrogen -- known as cold flows -- may be ferrying hydrogen through intergalactic space, clandestinely fueling star formation. But this tenuous hydrogen has been simply too diffuse to detect, until now." Astronomers have long theorized that larger galaxies could receive a constant influx of cold hydrogen by siphoning it off other less-massive companions.